Devon Travis got word of just how big his night was from all-star teammate Troy Tulowitzki. Travis had a career-high four hits as the Blue Jays busted out of their offensive slump to score a 7-5 win over the Tampa Bay Rays on Monday night. Travis had a triple and three singles, the last of which was a bases loaded go-ahead single in the seventh inning that pushed Toronto in front 5-4. The 25-year-old is batting .371 (33-89) over the last 22 games and entrenching himself in the leadoff spot for the Jays. “I think he’s just coming into his own,” Jays manager John Gibbons said. Travis was excited to learn of the career-high four hits in a game from Tulowitzki, his performance atop the Jays lineup ultimately sparking a club that scored only 17 runs a recent road seven-game trip (4-3). The seven runs scored Monday night at Rogers Centre were the most by the club this month and helped end a two-game slide. Perhaps the only Jay to hit consistently in recent weeks, Travis led off the bottom of the first with a triple to right, the ball scooting past right fielder Mikie Mahtook. Travis thought Mahtook, playing shallow, might catch it initially. “And then it fell and I was off to the races,” Travis said of his first career triple. A Bautista sacrifice fly scored Travis and was followed by Edwin Encarnacion’s 31st home run of the season off Rays starter Jake Odorizzi. 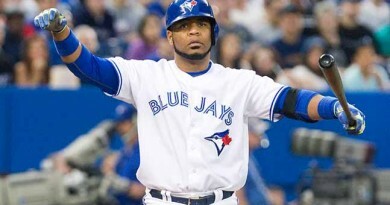 It was the 299th career homer for Encarnacion, who matched the Orioles’ Mark Trumbo for the Major League lead. Encarnacion is looking to become 12th active player in baseball with at least 300 home runs and 11th ever born in the Dominican Republic. Encarnacion’s home run was also the Jays’ 17th straight solo shot, the longest such streak in team history. Coming off one of his finer starts of the season (seven innings, one earned run), Dickey endured another rough start at home. He worked himself into and then out of trouble early. After Logan Forsythe reached on an infield single to start the game, Dickey walked Evan Longoria, struck out Brad Miller on a full count and then put Mahtook on with another walk to load the bases. Another strikeout, this time on Nick Franklin swinging, closed the nervous opening inning. Dickey threw 34 pitches in the frame, only 18 of them for strikes. He stumbled into trouble again in the fourth, this time unable to escape unharmed. The Rays scored twice, evening the score at 2-2, with Miller and Mahtook both hitting doubles. The Jays retook the lead in the bottom of the inning, loading the bases for Encarnacion. He ripped a single to left that plated two runs for the 4-2 advantage. Encarnacion remains the MLB leader with 94 RBIs, though indicative of the Jays’ offensive struggles this was his first multi-RBI game since July 20. Tampa struck right back for a pair of runs as Dickey continued to struggle in the top half of the fifth. After yielding a Forsythe single and hitting Longoria in the back, Dickey surrendered a two-run double to Miller, the score back even at 4-4. That was the end of the night for Dickey, who gave up four earned runs over only 4 1/3 innings. It was the fourth time in his last five starts that Dickey allowed at least four earned runs, his ERA now standing at 4.61. After threatening in the sixth, the Jays exploded in the seventh with a three-run rally that ultimately won them the game. Michael Saunders, Tulowitzki and a pinch-hitting Russell Martin all walked to load the bases before Travis cashed in with a single up the middle, scoring the go-ahead run. His clutch hit was preceded by a hard slide into home plate by Saunders, which broke up a potential inning-ending double play. “We did a lot of things that we’re going to have to do to win a championship,” said Dickey. Bautista then ripped a double to the alley in left-centre, scoring a pair for the 7-4 lead. The Jays right fielder finished with three RBIs. Roberto Osuna surrendered a solo home run to Forsythe in the ninth, but still notched his 25th save of the season to seal the win. The Jays played without centrefielder Kevin Pillar for the second straight day. He was placed on the 15-day DL earlier Monday with a sprained left thumb and was replaced in centre by Melvin Upton Jr., who went 1-4 in the opener against the Rays. January 1, 2016 Christina Vixx Comments Off on 2-0 Habs. 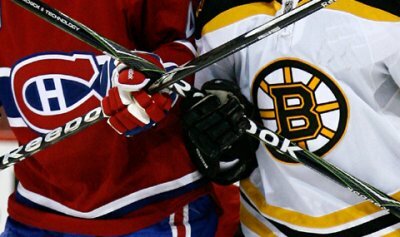 Do the Bruins have what it takes to come back? ?